Rabbit polyclonal SMC3 antibody. Validated in WB, IP, IHC, ChIP, ICC/IF and tested in Mouse, Human, Xenopus laevis. Cited in 39 publication(s). Independently reviewed in 6 review(s). Synthetic peptide corresponding to Human SMC3 conjugated to keyhole limpet haemocyanin. Which represents a portion within the last 100 amino acids GenBank PID 4885399. WB: Human placenta tissue lysate. K562 and Jurkat whole cell lysate. ICC/IF: HeLa cells. Human spermatocyte. IP: SMC3 IP in nuclear extracts from HeLa cells. IHC-P: Human colon and testicular seminoma tissue. Antibodies were affinity purified using the peptide immobilized on solid support. Antibody concentration was determined by extinction coefficient: absorbance at 280 nmof 1.4 equals 1.0 mg of IgG. Our Abpromise guarantee covers the use of ab9263 in the following tested applications. IP Use at 2-10 µg/mg of lysate. WB 1/1000 - 1/10000. Detects a band of approximately 140 kDa (predicted molecular weight: 141.5 kDa). IHC-P 1/500 - 1/2000. Perform heat mediated antigen retrieval with citrate buffer pH 6 before commencing with IHC staining protocol. Central component of cohesin, a complex required for chromosome cohesion during the cell cycle. The cohesin complex may form a large proteinaceous ring within which sister chromatids can be trapped. At anaphase, the complex is cleaved and dissociates from chromatin, allowing sister chromatids to segregate. Cohesion is coupled to DNA replication and is involved in DNA repair. The cohesin complex plays also an important role in spindle pole assembly during mitosis and in chromosomes movement. Defects in SMC3 are the cause of Cornelia de Lange syndrome type 3 (CDLS3) [MIM:610759]. CDLS is a dominantly inherited multisystem developmental disorder characterized by growth and cognitive retardation, abnormalities of the upper limbs, gastroesophageal dysfunction, cardiac, ophthalmologic and genitourinary anomalies, hirsutism, and characteristic facial features. CDSL3 is a mild form with absence of major structural anomalies typically associated with CDLS. The phenotype in some instances approaches that of apparently non-syndromic mental retardation. Belongs to the SMC family. SMC3 subfamily. The flexible hinge domain, which separates the large intramolecular coiled coil regions, allows the heterotypic interaction with the corresponding domain of SMC1A or SMC1B, forming a V-shaped heterodimer. The two heads of the heterodimer are then connected by different ends of the cleavable RAD21 protein, forming a ring structure. Acetylation at Lys-105 and Lys-106 by ESCO1 is important for genome stability and S phase sister chromatid cohesion. Regulated by DSCC1, it is required for processive DNA synthesis, coupling sister chromatid cohesion establishment during S phase to DNA replication. Nucleus. Chromosome. 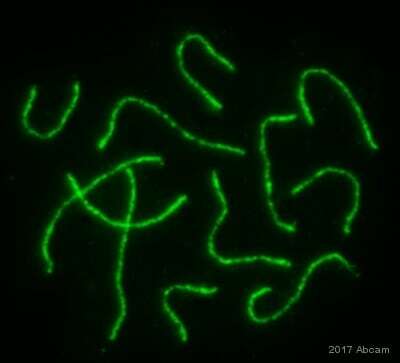 Chromosome > centromere. Associates with chromatin. Before prophase it is scattered along chromosome arms. During prophase, most of cohesin complexes dissociate from chromatin probably because of phosphorylation by PLK, except at centromeres, where cohesin complexes remain. At anaphase, the RAD21 subunit of the cohesin complex is cleaved, leading to the dissociation of the complex from chromosomes, allowing chromosome separation. Immunocytochemistry/ Immunofluorescence - Anti-SMC3 antibody - ChIP Grade (ab9263)Fukuda et al PLoS Genet. 2012 Feb;8(2):e1002485. doi: 10.1371/journal.pgen.1002485. Epub 2012 Feb 9. Fig S3. SMC3 is phosphorylated during prophase I. (Part of panel B) Nuclear spreads of spermatocytes were labeled with anti-pS1083, anti-SMC3 (ab9263) and anti-SYCP3 antibodies. Arrowheads indicate the XY bivalent. Bars, 10 µm. Interphase HeLa (Human epithelial cell line from cervix adenocarcinoma) cells stained with ab9263 (1/500). The antibody gave predominantly nuclear staining in all interphase cells investigated. ab9263 staining is shown in green. The cells were counterstained with DAPI (red). SMC3 signals (green) in a human spermatocyte at the zygotene-pachytene transition stage. Wider signals correspond to synapsed areas, whereas narrower signals show non-synapsed regions. This image was kindly supplied as part of the review submitted by Maria Oliver-Bonet. 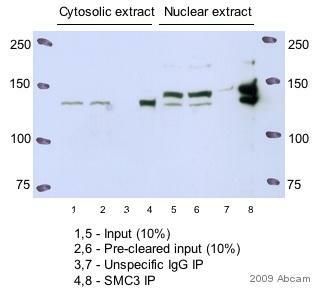 ab9263 Immunoprecipitate in HeLa (Human epithelial cell line from cervix adenocarcinoma) cytosolic and nuclear extracts. 500 µg of cell lysate incubated with primary antibody (1/100) and matrix (Protein A) in 20mM HEPES ph 7.8, 100 mM KAc for 4 hours at 4°C. 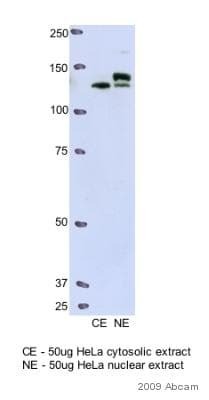 For Western blotting ab9263 was used at a dilution at 1/1000. ab9263 (4µg/ml) staining SMC3 in human colon using an automated system (DAKO Autostainer Plus). Using this protocol there is strong nuclear staining. Sections were rehydrated and antigen retrieved with the 3-in-1 AR buffer citrate pH 6.0. Slides were blocked with peroxidase in 3% H2O2 in methanol for 10 minutes. They were then blocked with a protein block for 10 minutes (containing casein 0.25% in PBS) then incubated with primary antibody for 20 minutes and detected with an amplification kit for 30 minutes. Colorimetric detection was completed with Diaminobenzidine for 5 minutes. Slides were counterstained with hematoxylin and coverslipped under DePeX. Please note that, for manual staining, optimization of primary antibody concentration and incubation time is recommended. Signal amplification may be required. Immunohistochemistry (Formalin/PFA-fixed paraffin-embedded sections) analysis of human testicular seminoma tissue labeling SMC3 with ab9263 at 1/1000 ( 1µg/ml). Detection: DAB. Publishing research using ab9263? Please let us know so that we can cite the reference in this datasheet. I would like to use the rabbit polyclonal anti-SMC3 antibody (ChIP-grade), ref ab9263 to detect SMC3 in an invertebrate. The antibody is raised against a peptide derived from the last 100 aa of human SMC3 and this region is well-conserved, but not completely, in the organism that interests me. I have performed an alignment of the sequence provided in the word document with the sequence used for ab9263. At the site recognized by ab9263, the human and Schistosoma mansoni (blood fluke) sequences are too divergent to expect ab9263 to bind. Please let me know however if you would like to test ab74582 in Schistosoma mansoni. I would like to use the rabbit polyclonal anti-SMC3 antibody (ChIP-grade), ref ab9263 to detect SMC3 in an invertebrate. The antibody is raised against a peptide derived from the last 100 aa of human SMC3 and this region is well-conserved, but not completely, in the organism that interests me. Would it be possible to know the sequence of the peptide that was used to generate the antibody, or failing that, could you analyse the corresponding sequence in my species of interest in order to determine whether or not it corresponds to the peptide? Unfortunately, at the site recognized by ab9263, the human and Schistosoma mansoni sequences are too divergent to expect ab9263 to bind. However, Anti-SMC3 antibody's (ab74582) immunogen shows a 90% sequence homology with the above sequence and therefore could work in Schistosoma mansoni. I am now informed that it was the following antibody that we were told had been discontinued: ab3600 Rabbit Argonaute 4 antibody Could you please confirm? Ab3600 - Rabbit polyclonal to Argonaute 4 - has not been discontinued; it is currently in stock in our office in the UK. If you have any more questions, please contact me again.